We partially replaced coal with natural gas, reducing 116,000 tons of CO2eq per year. 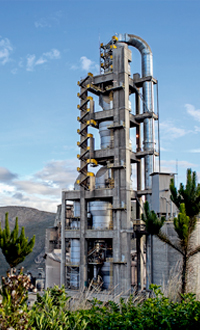 With this change of fuels we became the first cement producers in Perú to issue CO2eq CERs. We use clean energy; 96% of our electric power is supplied from hydroelectric sources. We modernized our industrial plants, for improved energy efficiency and fewer emissions of particulate material and GG. We produce blended cements that generate fewer emissions. Our plant is equipped with an 8.2 km underground conveyor belt, having reduced GG emission by 100%, in addition to reducing environmental noise, particulate material and emission of gases into the environment.